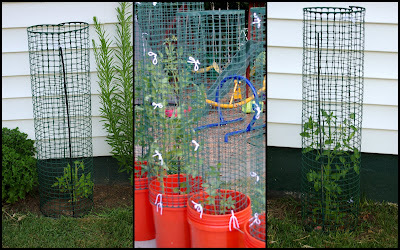 ...to outwit any and all four legged creatures and possibly a neighbor with tomato envy. That's right, you heard me. Let me explain though so you won't think I've gone completely insane. As you know already, the deer had their fill in my garden. I've also found evidence in the form of muddy footprints that a raccoon or two helped themselves as well. However, the neighbor, half-joking, said he didn't realize I had so many tomatoes growing and he would just come and get some of mine since the deer were eating his. Hmmm. Okay, okay, so it probably wasn't my odd neighbor, I'm just saying it's a possibility. Anyway, upon closer inspection of my already-producing tomato plants (celebrity, better boy, roma, and jet star) there is not a single tomato to be seen. Not one! *sigh* Several branches of the cherry tomato and lemon pear have survived and are still producing and the smaller plants that just began flowering are in survival mode. So how do I plan to outwit the four-legged creatures? Well, here, see for yourself. This lovely green garden fencing is my outwit plan. So far it's working against the deer. 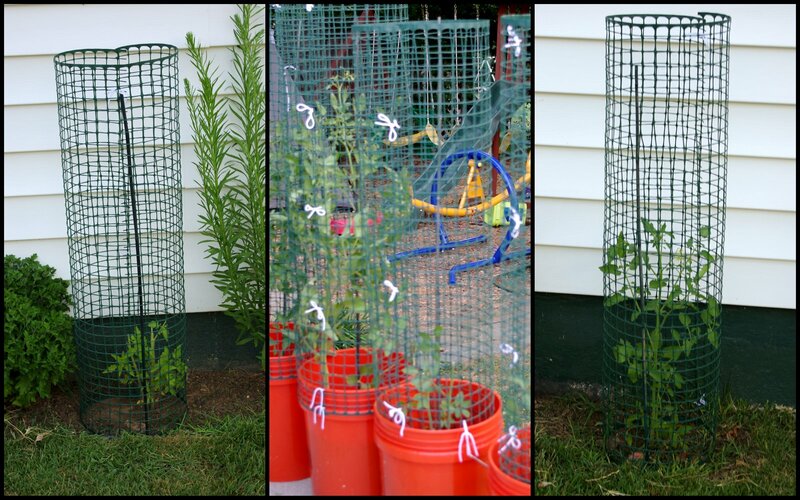 The raccoons, well, they could pull that fencing right off if they wanted more tomatoes. I hope they don't. Ah, yes, those orange 5 gallon buckets are my planters. They're only $2, and compared to the $15-$25 planters that were smaller, well, $2 wins. Plus, orange is my favorite color so I don't mind the brightness lining my driveway. My mature,already producing tomatoes are planted in the yard along the back porch. They stand unprotected. At this point I'm just trying to keep my younger plants in the survivor category. Now, I've got a question for you. Do you know what this plant is? My girls had a packet of wildflower seeds that they planted beside the house. This quickly growing plant is the only survivor. Right now it's about 4 feet tall, but I have no idea what it is. It could be a crazy weed for all I know. It just started getting some tiny buds so it should be flowering soon. I just thought I'd ask because I hate not knowing.